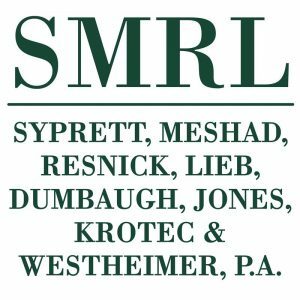 Syprett Meshad, Resnick, Lieb, Dumbaugh, Jones, Krotec & Westheimer, P.A. Over the past five decades, our firm has developed a reputation for providing world class legal representation to our clients. Our attorneys will listen carefully to your story in order to understand your unique situation. This enables us to craft a customized legal strategy that will help you achieve your desired outcome. Our attorneys have the extensive experience to assist you with just about any legal issue you have. When you work with Syprett, Meshad, Resnick, Lieb, Dumbaugh, Jones, Krotec & Westheimer, P.A., you’ll receive the highly personalized representation you deserve, and our seasoned litigators will aggressively protect your rights and interests every step of the way.